The earliest memories were from visits to The Clark Art Institute when I was in high school, where paintings by Homer and Inness in particular made a strong impression. At the same time, I developed a love for the outdoors through early attempts at fly fishing, hunting, and camping. The Adirondacks and the forests and streams near where I now live were special to me. The combination of these interests led me to painting. 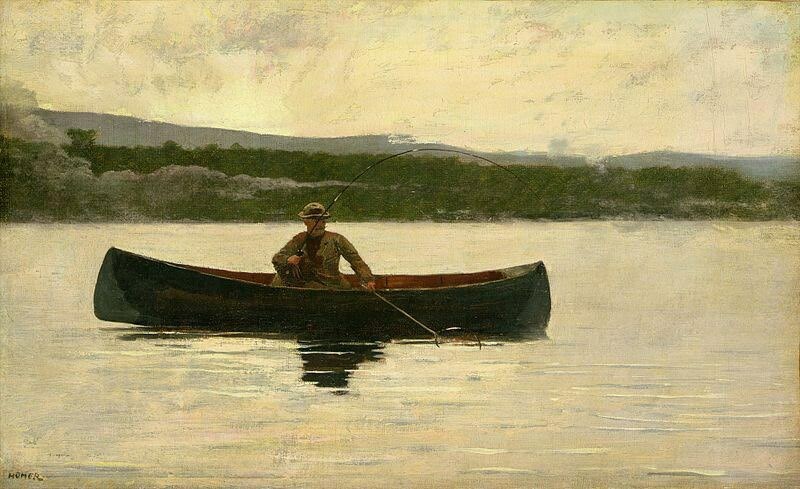 Winslow Homer, "Playing a Fish"
How have your bodies of work changed over the years? What was the process like in finding your visual vocabulary? My time in undergrad at Union College gave me a strong background in drawing and color theory. Graduate school at Tyler immersed me in contemporary painting. In both cases, the motivation was to make art without the fussy fineries of the art store materials and easels and all of that baggage. My first work was minimalist and materials came from the hardware store and lumber yard. This evolved to various attempts at abstract painting influenced by what was happening in New York in the late seventies. This was the body of work that got me my first teaching jobs, shows, and opportunities to write for art magazines. Ohio State hired that guy and then ended up with a landscape painter. A number of abstract painters drifted that way in the eighties. For me it felt like coming home. I got tenure despite, or maybe because of, my new direction. What draws you to a particular scene for your pieces? 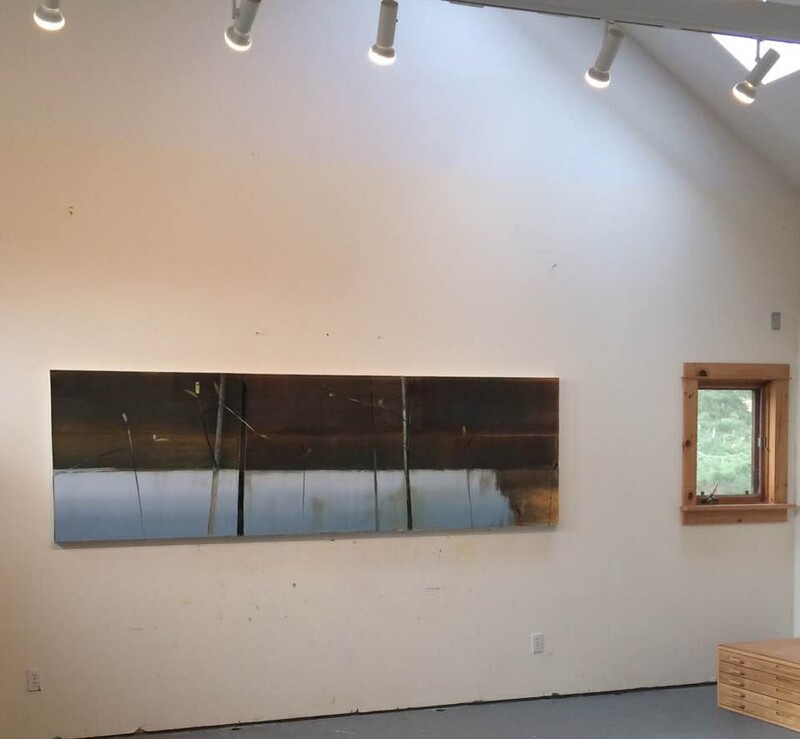 At this point I can say the work is quite abstractly derived from years of drawing and painting from sources as diverse as the rivers of Montana, Penn’s Creek, the Catskills and Adirondacks, and even a river close to home when we lived in Ohio. Now I am always alert to the color and light that surround me near our home in Stephentown, and even the particulars observed along our very own trout stream, the Kinderhhook. But once in the studio the paintings develop as collages and remixes of themes developed over several decades. I once developed ideas primarily through paintings on paper. Now I tend to collage and remix in digital variants from a portfolio of past paintings. 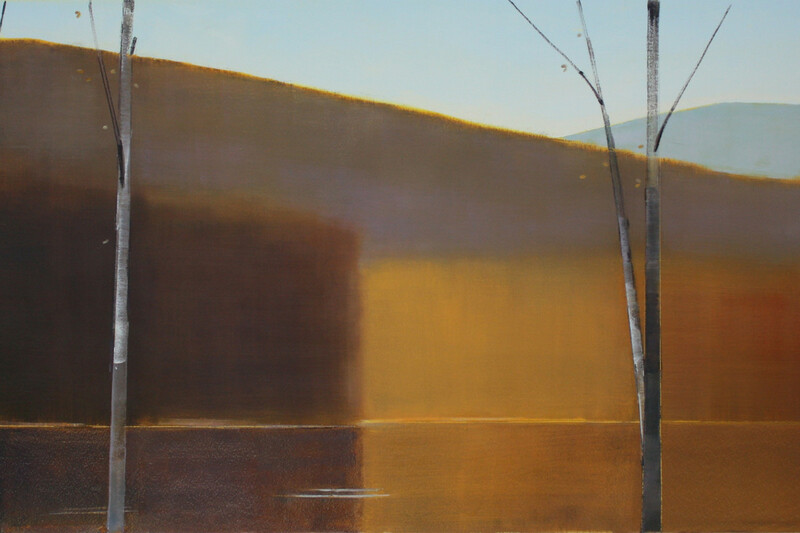 The painting process is built on broad very structural gestures. One tie to my earliest work is my preference for large house painters' brushes, and tools meant for plaster or drywall work. These keep me at a safe distance from illustrative detail and focused on the whole composition and color movement. The paintings are built in layers of color in a chromatic progression. This leads to subtractive, darker or muted colors with the parent colors emerging from the earlier layers. The painting is primarily wet-into-wet, and the decisive work must be done in a day or two. When people ask how long it takes to do a painting I say “forty years and a day." I’ll quote Chuck Close here: “Inspiration is for amateurs. The rest of us get to work.” I work all the time. My studio is attached to our home. I go there and get to work. For influences I’ll mention again the painters I saw at the Clark, but as time went on it has been the serial dedication of painters like Albers, Morandi and Roman Opalka that have been influential. What prompted you to work in diptychs and triptychs for your current body of work? What are you exploring by doing so? What tickled me about the idea of working in these multi panel formats was the chance to solve the formal problems of “one plus one equals two, or maybe three … or maybe just one.” A teaching colleague once pointed out that my paintings could be divided into a number of satisfying compositions. So there is that, but also the logistical challenges that come with doing larger work on panels and being able to transport them safely. I like the meeting of the pragmatic and the poetic. Once into the series I was reminded of my earlier years when I was struck by paintings like Fra Angelico’s "Annunciation at San Marco." While this is not a diptych it is, in the convention of the subject, a painting divided in two realms. I find myself thinking of boundaries, divisions and separations that are a challenge to reconcile. What do the pieces in your forthcoming show, "More or Less," represent about where you are currently in your evolution as an artist? Right now these new paintings have provided an opportunity to live up to the potential that my studio space invites. I have this large wall that has, for some time been asking me to take advantage of it. The next work will come from going back into the studio and getting down to work. Sometimes the trigger of a commission request will provide the challenge. Sometimes the change of season kicks me in a new direction. Most often a sense of a gap in what I have been doing propels me to fill it. Explore more of Stephen Pentak's work here.